At the start of my internship search, I found myself at a professional crossroads. I was unsure how my interests in business analytics and brand strategy would play into my career. As a business major, it was lonely navigating career options as a person who doesn’t relate to the traditional consulting or banking role. I felt that my prior internship experiences left me with a list of do’s and don’ts, likes and dislikes guiding my career search, but was lacking an area of focus that I was passionate about. I let these factors lead my job search, which ultimately landed me the role as a Marketing Associate at AlphaSights. After a rewarding summer of projects, presentations, and high-impact responsibilities, I’ve realized how much being at a high-growth company played into my ability to check off all three boxes. My focus moving forward in my professional aspirations has shifted to finding a company that embodies the spirit of constant growth and development. As I approach my final weeks at AlphaSights, I’ve reflected on my strengths and areas of development. Here are key takeaways on how to succeed in the fast-paced, constantly changing environment of a high-growth company. 1. Be adaptable. Embrace change. Change is often thought of as a symptom of growth. My internship experience showed me that even more importantly, an openness to change is a prescription for success as businesses scale. Working at a firm that embraces and celebrates the fact that change is as much a cause of growth as it is an effect, was instrumental in my ability to unlock my full potential this summer. I quickly recognized that everyone around me was constantly thinking of ways to improve and grow. Whether that be through trialing new technologies to perform better data analysis or pitching and implementing new strategies for prospecting, no technique was safe from further innovation. This realization acted as a motivating force for me to continually push my own boundaries. I had to adapt as quickly as the firm was and is changing. This has been a true test of my ability to think on my feet, learn with agility, and take on new challenges without hesitation. 2. Empower your ideas and own it. Because my team encouraged experimentation and ingrained change as a key part of our culture, I was empowered to vocalize my ideas without fear of overstepping boundaries. I naturally entered my summer position with an “I’m just an intern” mentality. I was hyper-aware that coming in as a new-joiner and immediately pitching ideas for improvement could easily be misconstrued as entitlement. However, I was met with a completely opposite reaction, receiving my first significant piece of feedback from my manager to more purposefully vocalize my ideas to the team, take complete ownership of the projects I initiate, and not be afraid to speak confidently about the topics that I’ve become an expert on. Receiving this feedback completely changed my perspective and performance. Rather than being timid and overly cautious when presenting ideas, I assumed a new tone of confidence and excitement when talking to my team. Taking that advice not only built more credibility for myself and my abilities, but also opened the doors to the projects and initiatives I’m most proud of completing this summer. 3. Don’t say unnecessary ‘sorries’. The three words I heard the most this summer were “don’t say sorry.” Apologizing before I asked a question or when I needed more clarity on a new concept are just two examples where saying sorry placed unnecessary blame and guilt on perfectly acceptable situations. An effort to stop feeling the need to qualify myself, being hesitant to share my opinions, and apologizing for things out of my control has played a large role in my maintaining a positive outlook that is more focused on how to improve in the future than feeling sorry for the past. 4. Give and receive feedback well. A company that is constantly growing relies on both internal and external feedback to gauge whether it’s successful. AlphaSights truly believes in the idea that feedback is a gift. I was encouraged to give radical candor and engage in feedback sessions to the whole team on a weekly basis. The concept of radical candor, as created by Kim Scott, is to give upfront and honest feedback out of genuine care for the betterment of a person or team. Candor is most effective when feedback is incorporated into normal conversation, making the topic of how we can improve a consistent part of our everyday vocabulary. Open feedback is vital to effective change. My ability to accept constructive criticism with gratitude and excitement rather than disappointment has been paramount to my personal growth. Every piece of feedback I’ve received this summer has taken form as a key takeaway that I will carry over into my professional future. As a fresh face to the company, I learned that my opinion was especially valued because I had something that no one else has: a fresh perspective. Hearing this from my manager was validation that I had the power to make real impact on the organization, despite only having ten weeks to do so. This motivated me to think deeply about every process and project I was exposed to as well as begin thinking of ways to iterate and improve them for the better. In order to make suggestions that would actually drive impact, I needed to understand everything we currently do, why we do it that way, and what we’ve tried in the past. I also had a unique position this summer where I was able to work closely with managers of every level. Sitting directly across from my VP Sloan Danenhower, next to my manager Izzy Spada, and having scheduled weekly meetings with our Global VP Greg Sexton, there was no excuse for me to leave any question unanswered. Questioning everything put in front of me was fundamental in thinking of creative solutions to address the challenges I saw hindering our processes. No point of feedback was off-limits and my suggestions were taken seriously across the team. I truly believe that a high-growth environment like that of AlphaSights is special. Receiving these five points of feedback would be unheard of in a company that’s not receptive to change and innovation. My experience at a high-growth company showed me that a company’s investment in their employees’ growth is synonymous with corporate success, making growth a key factor in my decision-making process moving forward. Internalizing these lessons has been the guiding force of my personal and professional transformation this summer and I’m leaving this experience feeling more confident in myself, my capabilities, and my future. 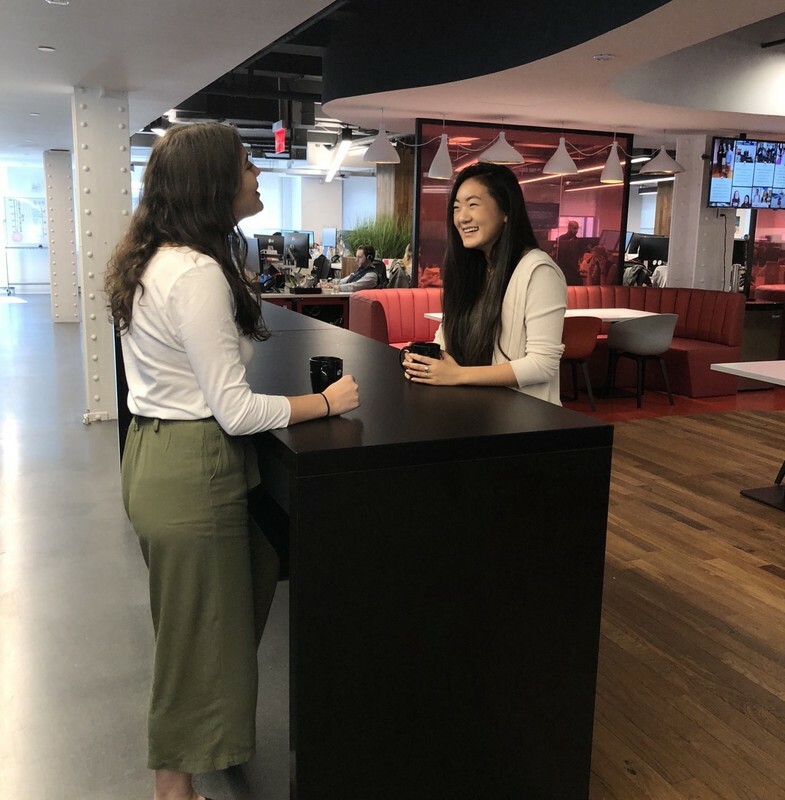 Lyrie Wang served as a marketing associate in AlphaSights' New York office in the summer of 2018 and will return as a full-time Demand Generation associate in 2019.